Keralites are extremely simple and warm hearted. As they are constrained by limited space and the need to protect their unique eco-system, most of the educated youth move out of the state to earn a living. Kerala cannot aspire to become an industrialised state like Maharashtra or Tamil Nadu as 33 million Malayalis are very protective of their lifestyle. A militant labour and politically conscious people make things really difficult for potential investors to start their business in Kerala. Malayalis cherish their lifestyle and follow age-old customs and practices zealously. Rationalism and scientific temper are common among the citizenry, while households follow matrilineal system of giving primacy to women's views in decision making. It is common to see joint family system still thriving in Kerala where both husband and wife go to jobs to make money. Much planning and deliberations take place on the issue of how to run a household (both joint and nuclear families) which gives importance to the opinions of its senior members (like grandparents). 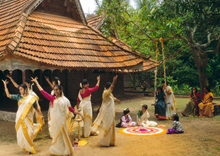 Among the southern states, Kerala is most vibrant in its family-oriented life and a culture steeped in religiosity. Despite the inroads of materialism and competition to succeed in life, Keralites give much importance to family values and abide by the decision of the elders. They are not only simple in their dressing, and the way of living but also follow the motto of "simple living, high thinking." Art and culture are given a lot of significance. Elders make it their responsibility to pass on religious teachings to the younger generation. This ensures that their religion and culture stay intact for years to come. 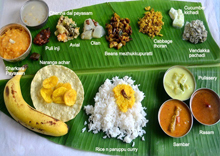 Leading a simple, straight-forward life surrounded by family members, a Keralite is proud of the heritage and takes pleasures in enjoying simple things on earth. A sound education in school followed by a prestigious degree in a reputed college for a secure, high paying job is the charted course of a Malayali youth. Even at tender age, the parents inculcate the value of education into their children. Right from the primary school, Malayalis take education seriously. The rich families send their wards to global institutions like Oxford, Cambridge and Stanford for higher studies with the hope that they will make a grand beginning in their chosen profession. Education is given much importance here as both male and female pursue higher studies with equal vigour. Unlike other states, Kerala follows matriarchal system in the households. The property is inherited by the younger women from their mothers and grandmothers. Men also get a share in the property depending on the wishes of the benefactor. The GenNext women in Kerala prefer official work, rather than getting stuck in cooking and other household chores. However, even career women have a deep sense of filial affection and care much about the welfare of their family. A secure job in the service sector including software, teaching, banking or finance is most sought after by Keralite women as it suits their attitude. With scarcity of jobs in Kerala, skilled youth seek a secure placement in the Gulf countries instead for waiting for a break in their home state. It is estimated there are nearly 3.5 million Keralite diaspora, mostly working in the Gulf region, and their annual remittances to their households back home have crossed Rs 1 lakh crore in 2014. Families having a migrant in the Gulf enjoy a lavish lifestyle with palatial house, car and an array of appliances for modern comforts. But they don't flaunt their richness and material acquisitions as ostentatious life is not approved in Kerala society. Most of the families lead a contented life and invest the surplus wealth in real estate or savings instruments for multiplication. A clean look with simple dress is admired in Kerala. Keeping the body clean with daily bath and observing the rituals are must and followed diligently. The dressing style of the Malayalis is remarkably straightforward and ordinary. Showing off is frowned upon. They lay stress on the quality of life that comes with simple living and high thinking. These are unassuming people are happy in their small world. They eat simple food and ensure that whatever they are eating is healthy and nutritious. They make sure that they are eating a balanced diet. Materialistic pleasures are not given a lot of importance and instead they revel in mental satisfaction. Men wear a dhoti along with a shirt. The dhoti resembles a 'mundu' which is white sari worn over blouse by women. A cotton lungi is also worn by men. This is a dress just like a sarong. However, city life has changed the dress code of Malayalis as they wear myriad suits from South Indian clothing to North Indian materials. A professional, high-tech Malayali is equally comfortable with European dress materials and can even speak a number of foreign languages too. 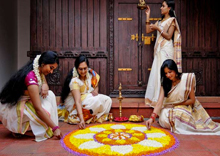 Onam is the right time to be in Kerala as the state bristles with cultural activities, events and exhibitions. According to legend, the festival is a celebration of homecoming of King Mahabali on this day each year. This demon king was pushed to the netherworld by a dwarf Vamana, an avatar of Lord Vishnu, after Mahabali lost out in a verbal encounter. Another festival is Vishnu, the new year in Malayalam calendar, which is celebrated with pomp and rituals. Malayalis visit the houses of relatives, entertainment spaces like cinema theatres, exhibitions and shopping malls during festive occasions. Social interaction and bonding with relatives and friends have been one of the cherished practices of Malayalis during festivals.